Boston Red Sox outfield prospect Andrew Benintendi went into the 2017 season the preseason favorite to be the American League Rookie of the Year. His numbers were solid (.271 batting average, .776 OPS, 20 home runs) and he absolutely lived up to expectations, which could not be said for some of Boston’s other young stars (looking at you, Xander Bogaerts). As a Red Sox fan, I am now terrified of losing him (and Rafael Devers and bowling sensation Mookie Betts) in a trade for Giancarlo Stanton. In most other years, Benintendi would be the Rookie of the Year, but 2017 was the year of Aaron Judge, so it was an open and shut case, so to speak. Aaron Judge was the story of the season, or one of them anyway. Sure, three teams won a hundred games, and sure, two hundred win teams faced off in the World Series for the first time since 1970, but the New York Yankees nearly threw the whole postseason into chaos. First, they disposed of the Cleveland Indians in the ALDS, before taking a 3-2 series lead over the eventual champion Houston Astros. They would not have even gotten that far were it not for the surprise performance by their gigantic rookie outfielder. Judge batted .284, had an OPS of 1.043, and finished 2017 with a WAR of 8.1 by Baseball Reference’s calculation. But the most eye-popping stat to those both analytically inclined and challenged was his 52 regular season home runs, breaking the benchmark of 49 set by Mark McGwire in 1987. Even when he was constantly striking out, Judge’s at bats were appointment viewing, or appointment following on social media. 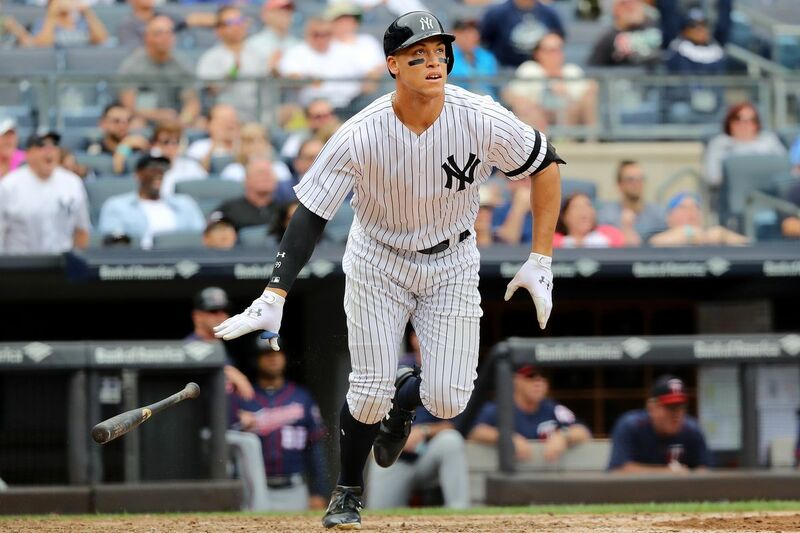 The combination of Judge’s gigantic frame, gigantic swing, and the fact that he plays in New York immediately made him one of baseball’s biggest stars. Mike Trout has been the best player in the game when healthy since he was a rookie in 2012, but none of my friends would recognize him if he walked into a bar unless he was in his Angels uniform, and even then, some of them might not figure it out. Aaron Judge is going to host Saturday Night Live someday. I’m calling it now. This season proved that Major League Baseball will go on just fine without the intrigue of “will they ever win?” hanging over the Chicago Cubs. This World Series between the Astros and Los Angeles Dodgers was every bit as compelling as 2016 was, and the postseason put a new generation of exciting young stars–from Judge to Jose Altuve to George Springer to Francisco Lindor to Cody Bellinger (who was unanimously voted the National League Rookie of the Year today)–and the game is in a great place going forward. In fact, and I have no scientific evidence to back this up, this is the most excited I have ever seen the people with whom I interact on a daily basis get about baseball in a year when the Red Sox did not reach the World Series since 2003. Aaron Judge will be a huge part of the Red Sox/Yankees rivalry going forward, and the two teams are due to meet again in the postseason. The Red Sox and Yankees both made the playoffs–the Red Sox won the division and the Yankees beat the Minnesota Twins in the AL Wild Card Game–but both fell to the Astros, and subsequently fired their manager. As close as they are, Yankees fans feel a lot better about their team going forward than Red Sox fans do. That vibe in and of itself is a testament to Judge, and to New Yorks other young players and the level at which they performed this year. I am nowhere near ready to give up on Benintendi, or Betts, or Devers, but the Judge and Gary Sanchez and Didi Gregorius showed up in October, and that matters.